Don’t understand Mint’s headline for this piece. What does will o wisps mean? Maybe from a poem. But I find this notion of ancient humans communing with the heavens through wisps of smoke very touching. Mutrah Souq in Muscat, Oman, is not as large as Istanbul’s Grand Bazaar, nor is it as visually interesting. Most of the bigger shops that sell frankincense, spices, nuts and attar are run by Indians. At one emporium, a delicately featured bearded, grey haired man who speaks Arabic, Urdu and Hindi is explaining the concept of bukhoor or incense that most Omanis burn in their homes to ward off the smell of fish after cooking and also to make the home smell fragrant. Omanis use bukhoor in a far more delicate fashion than we do in India. At the home of Shawqi Sultan, a bon vivant businessman who belongs to one of Oman’s oldest families, you can barely see wisps of smoke, yet there is a lingering implacable scent. Scent and smoke are etymologically linked. The word perfume comes from the Latin word per fumus, which means, “through smoke”. Ancient cultures burned perfumed wood and resins as a sacred offering to the gods. Coptic, Greek and other orthodox churches used scented smoke created from frankincense and myrrh, which along with gold were the gifts of the Magi when they came to see Jesus Christ. The Jewish Talmud has a specific recipe for formulating the incense that would burn in Jewish temples. Before we had vials of sandalwood and jasmine essential oils; before we had customized perfumes in coloured crystal bottles that were lined up on our mothers’ dressing tables; before we had fragrance “noses”, which is the term the perfume industry uses to describe those men and women who mix and match commercial perfumes that end up on the floors of Colette Paris, Harrods in London, Barneys New York and DLF Galleria; before we had branded perfumes with seductive names such as Angel by Thierry Mugler—one of the perfume world’s iconic scents; before we had champaka and oudh and other exotic ingredients; the way humans communed with god and comforted themselves was through perfumes or sacred, scented smoke. Indians still burn scented smoke in their homes, by throwing a few sprinkles of benzoin resin into glowing coals. North Indians call this loban and south Indians call this sambrani. 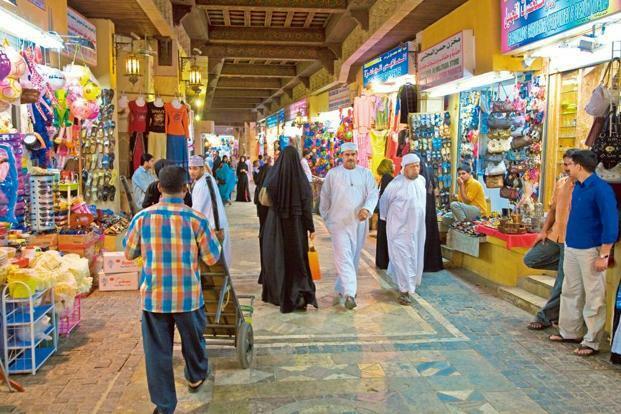 The word loban comes from the Arabic word luban, which is what the vendors at Mutrah Souq call it. The best luban, they say, comes from Salalah, where frankincense resin is harvested from bruised trees that create this resin as a defensive reaction. It is interesting that most religions use fragrant smoke from incense and other sources to commune with God. Seeing these curling wisps of smoke go upwards to the clouds gave early worshippers the feeling that their thoughts and desires were carried up to the heavens. The other reason must have to do with what today’s nightclubs call ambience: creating the mood for religious communion. Darkness punctuated by glowing light helps this, witness the beautiful stained glass windows in churches. Temples and mosques too are designed to filter light into the prayer area. Some sort of intermediary in the form of priests helped translate human desires and wishes into the language of the Gods, be it Hebrew, Sanskrit or Latin. Elements like water and fire were used as tools to touch the sacred. Omani bukhoor, Indian loban or sambrani are a way to return scent to its sacred roots. French perfumer Philippe di Meo does this with his new, extremely niche line called Les Liquides Imaginaires. The first trilogy is heavy with religious imagery. Sancti has bergamot and mandarin and alludes to the protective holy water that is sprinkled in churches. Forti with amber, oudh, guaiac and saffron refers to fortitude. Tumultu is sensual, according to the fragrance notes and has coconut milk, grapefruit and cedar wood. I haven’t smelled these fragrances but like the notion of returning perfume to its sacred roots. One easy way to do this is to burn sambrani or loban or bukhoor. How do you scent your home? Do you use oriental lilies and tuberose? Or do you buy essential oils from Fragonard that smell of vanilla and lavender? Do you smoke it with sambrani once a week? The best scents create memories for residents and visitors. The Taj and Oberoi group of hotels do this. Both the The Oberoi, Bangalore and The Taj West End have a signature scent that hangs in their lobby. Smelling it elsewhere can conjure up images of these hotels. The same thing happens at home. A homesick child can smell nutmeg several continents away and be reminded of home. Scent can comfort by teasing out memories. Omani bukhoor is expensive because it is mixed with dried rose petals, wood chips that are dipped in essential oils, and resins. The trick is to sprinkle the bukhoor with restraint, something that I have learned to do with my sambrani as well. To sit in a silent room in the early hours of the morning, and watch a wisp of smoke climb up is to experience the divine. Of course, it also happens that in India, when you are in the midst of your meditation in the early hours, aided by fragrant incense, you will hear the hungover drunk on the street give a loud, stirring, and off-key rendition of Yeh Jo Mohabbat Hai, which, too, can be divine. The Vaishnavi Flora incense in Shoba Narayan’s home is now associated with Rajesh Khanna thanks to a song sung at one moment. I had wondered about the that title. Why would a columnist of your renown and reputation permit some sub-editor hack to title your column? I am going to suggest titles from now on, Stan. More than suggest, insist that any title or editing they come up with must be run past you and obtain your agreement. I do.